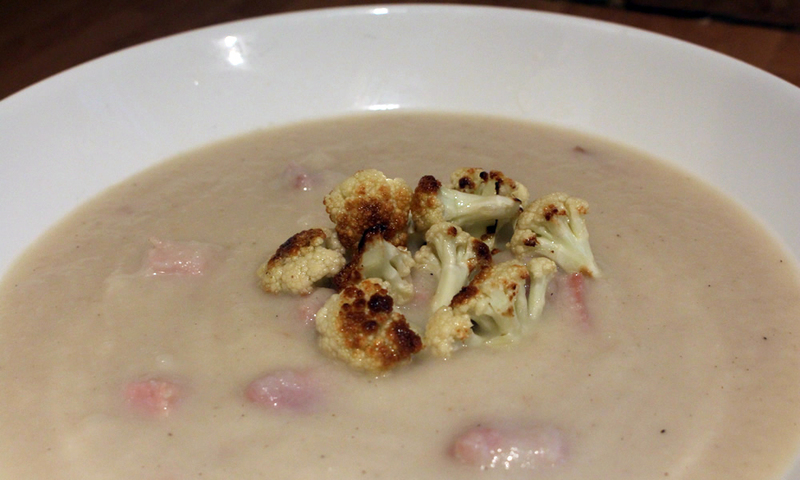 This is a perfect recipe to use up that last bit of christmas ham and any cauliflower if you have any. For the stock I used the cooking liquid from the cooking the ham but chicken stock would work just as well. If using the ham cooking liquid just becareful to skim off all the fat and check for saltiness before adding it to the soup, diluting it with water if too salty. Finely chop the onion and garlic and add to a heavy based pan with a nob of butter and sweat for a few minutes until the onion becomes translucent. Chop the cauliflower into small florets and add to the pan and cooker for a further 4 minutes occasionally stirring to prevent burning. Add the chicken stock or ham stock if using and simmer for at least 20 minutes so the cauliflower is tender. Leave to cool a little and blend well until the mixture is very smooth. Add the ham pieces and begin to gently simmer again. Taste and season with the salt and white pepper. When the soup is ready, keep warm while you fry the extra cauliflower florets. In a wok or frying pan add a little oil and bring to a moderate heat. Add the small florets and fry until they start to go brown and crisp. Put the soup into bowls and add the crispy florets to the centre of each bowl. Serve with crusty bread.